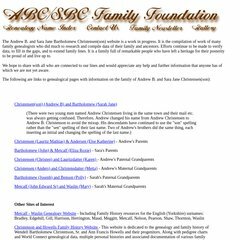 Topics: Bartholomew (joseph) And Benson (polly), Metcalf - Waslin Genealogy Website, Abc&sbc, Lmc&eka, Jb&erm, and Cc&kl. Its IP Number is 38.113.1.97. Ionet Inc (District Of Columbia, Washington) is the location of the Nginx server. Its 2 nameservers are ns1.bizland.com, and ns2.bizland.com.